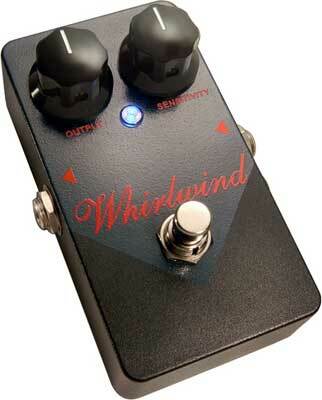 Shop Whirlwind Rochester Red Box Compressor Pedal from AMS with 0% Interest Payment Plans and Free Shipping. The Whirlwind Red Box Compressor is a true classic and can be heard in almost every great rock recording of the 70s and 80s. The Red Box compressor pedal is best known for its crisp percussive attack when applied to a clean guitar as well as it lush rich sustain when soloing. "As one of the original founders of MXR, I first brought these effects pedals to guitarists almost 40 years ago. They were the ones that started a revolution and no one has made them quite the same since . . . hand-wired, American made, built to last forever and with the exact same circuits and quality components. It's the way we did it back then and it's the way we've approached everything we've done since. With this new line of vintage pedals, the ONLY things we changed are the addition of true-bypass, a 9 Volt power inlet and an LED to indicate when they're active. To celebrate 40 years in rock-n-roll, we're proud to release the Rochester Series pedals. You're gonna love 'em." Input Jack: Connect a cord from your instrument here. Removing the cord from the input jack when not in use disconnets the battery which will prolong battery life. Output Jack: Connect a cord to your amplifier here. 9 Volt Input: Connect an optional power supply here. Accepts an industry standard 9 volt regulated DC supply with a 2.1mm barrel type connector. Output Level: Controls the overall volume when the effect is engaged. Sensitivity: Controls how much compression is applied to the signal. Turning the control clockwise aplies more compression resulting in increased sustain by limiting the loud peaks and boosting the soft parts of the signal. Status LED: Illuminates when the effect is active. 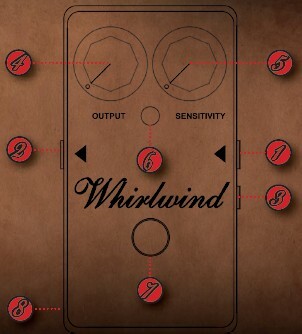 Footswitch: Turns the effect on and off. When off, the unnit is completely removed from the signal path (True Bypass). Battery Compartment: Remove 4 screws on the bottom of the unit to access the battery. Be sure to leave the protective insulator in place to prevent the circuit board from contacting the metal case. Had it for a month. No problems. Quiet, well-built, and simple to use.